It's that time again! Today, the vBulletin development team is proud to unveil for the first time the forthcoming vBulletin version: 3.7.0.
vBulletin 3.7.0 contains a plethora of new features, many of which have been long requested by users and customers, while other new features will come as a surprise to everyone. 3.7.0 is slated to be the final major release of the vBulletin 3.x series before all forum development efforts are switched over to vBulletin 4.x, after which 3.x will receive only bug fix releases. 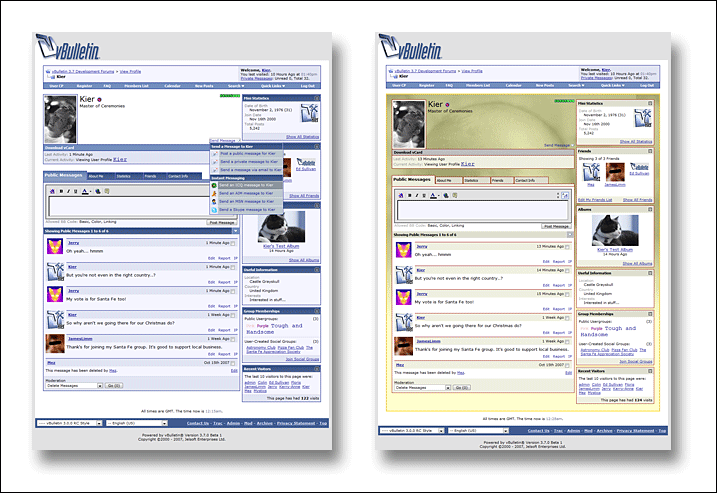 In terms of timescales, the plan is to upgrade vBulletin.com to run on vBulletin 3.7.0 on Monday (November 26th) and to let it run for a few days in order to get some feedback and bug reports before releasing the first public beta. So, to the important bit: what's new in vBulletin 3.7? 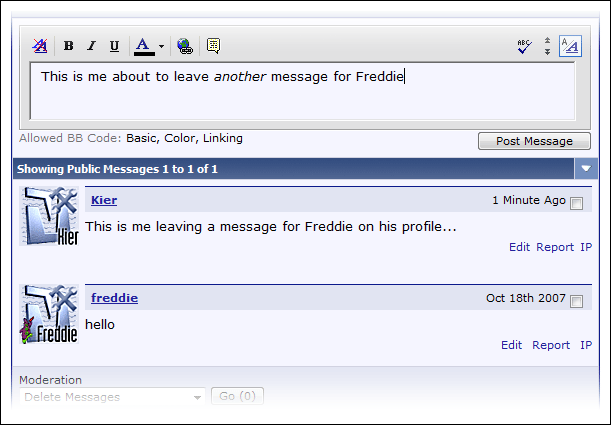 Forum spam is an increasing problem for many boards. Unfortunately, due to the visible-source nature of vBulletin and most other forum systems, most preventative measures we might add to the system can simply be reverse-engineered and worked around by persistent spammers. Therefore, 3.7 contains a new set of tools to help clean up spam and deal with spammers. 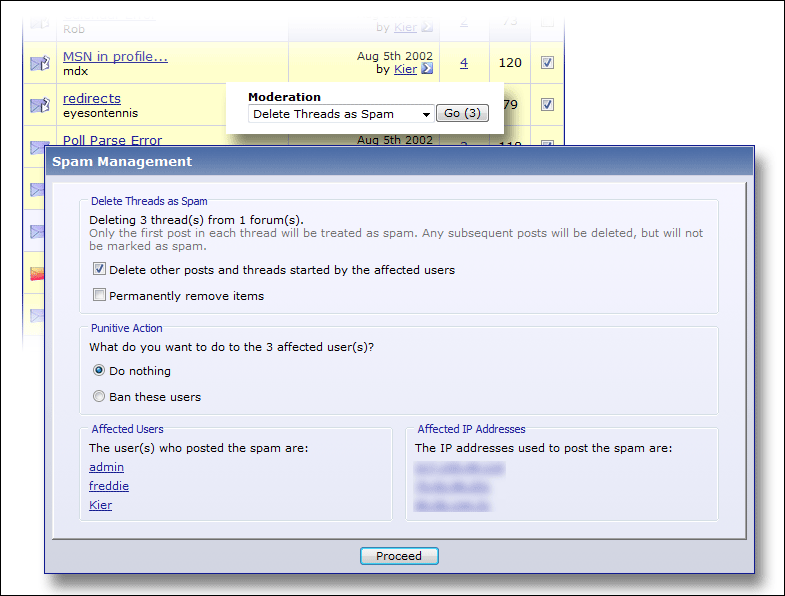 Threads and posts can be selected in the usual inline moderation fashion, and then the new 'Delete Threads/Posts as Spam' command can be selected, which will load the spam management interface, which contains options on a single page for removing the spam posts and threads, banning the spammers and finding other spam they may have posted. A new way to facilitate searching and grouping of threads, it is now possible for users to add tags to threads they post or read. 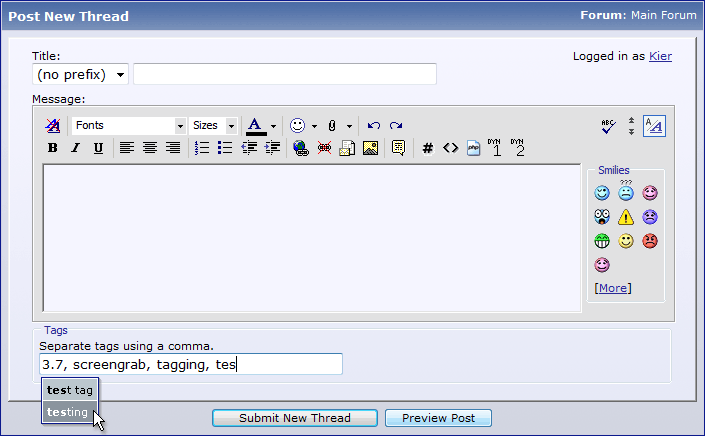 Tags can be added when creating a new thread, or to an existing thread by any user (with appropriate permissions). Any users who then click on these tags will not only find all thread that have the same tag as the one clicked, but will also contribute to the building of a search tag cloud, which gives users a quick guide as to what has been searched for recently and most frequently. Long requested by users, threads can now have administrator-defined prefixes to their titles. 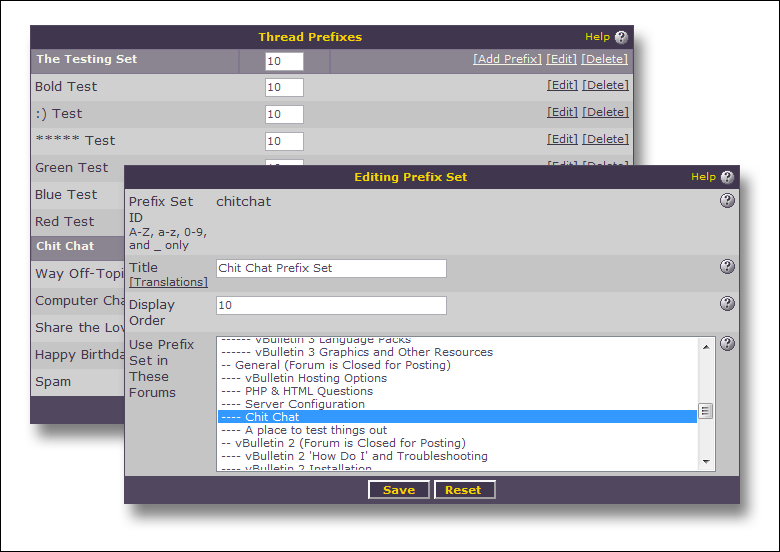 Thread prefixes are divided into groups by the administrator, allowing different prefixes to be available in different forums. Here is a new screengrab showing some of the thread prefix administration system, which should answer a lot of questions we have been receiving. 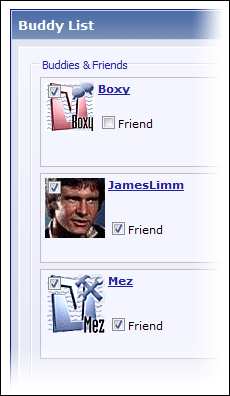 As part of our new social networking system, users can now request that people on their buddy list confirm their friendship, after which time a person's list of confirmed friends will be viewable to other users. 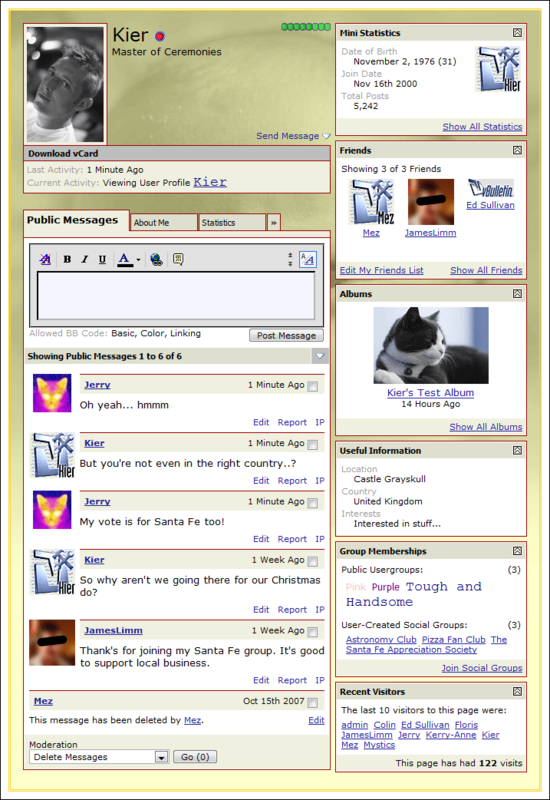 While private messages between users have been in vBulletin since version 2.0, vBulletin 3.7 introduces the public messaging system, allowing users to communicate publicly via their profile pages. 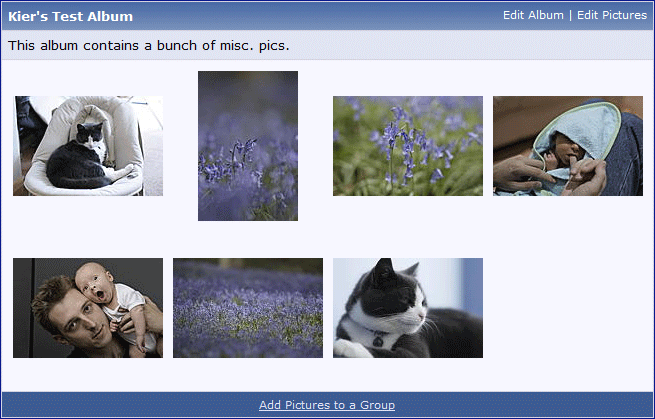 vBulletin users can now create albums and upload pictures to their account. The ability to view these albums and pictures can be limited by the user to just board staff and people on their buddy list if they want privacy. To further social cohesion between users and to encourage people to make friends, vBulletin now includes a facility to allow users to create their own social/interest groups. 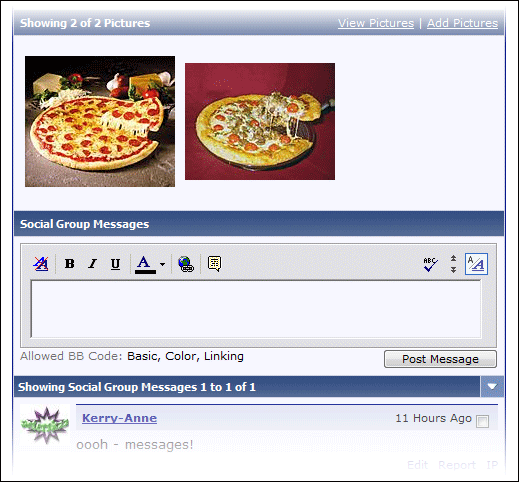 These groups are enhanced by having their own public messaging system, and the ability to add pictures to the group from user albums. In order to accomodate all the new features in vBulletin 3.7, the member profile page has been completely redesigned from the ground up. The new page presents information in a far cleaner and more logical manner, while dividing up information into manageable chunks using a tabbed interface. 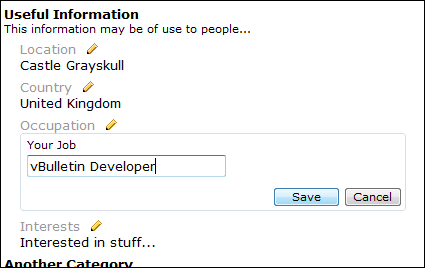 Individual profile field categories can be displayed alone in blocks in the right column, in addition to appearing by default in the 'About Me' tab. 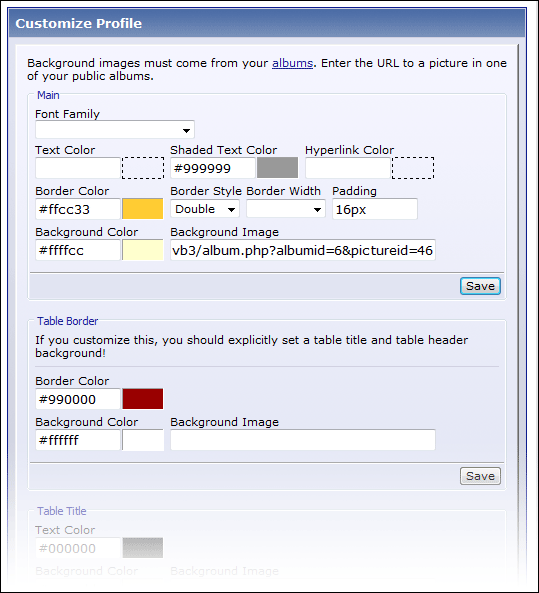 The administrator may choose to allow his members to use the profile page customization tool, which allows users to alter fonts, colors, background and borders etc. of their profile page in order to create a more personalized look. 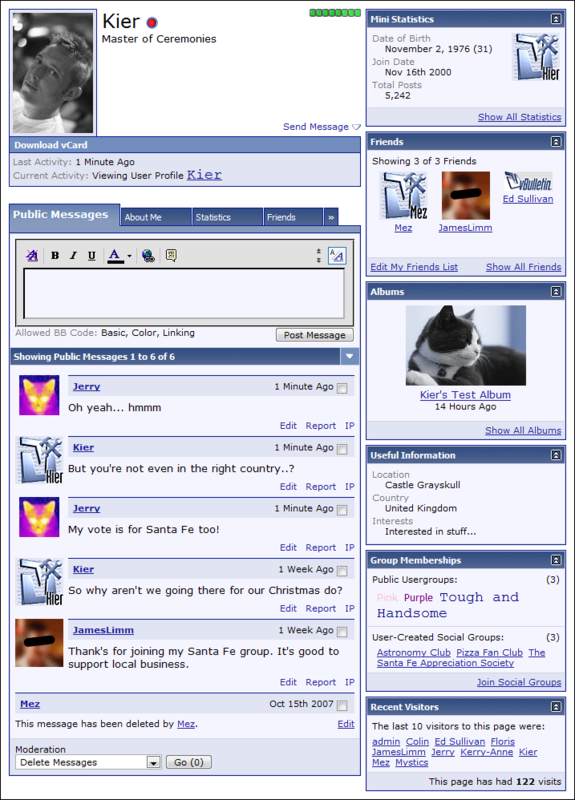 The administrator can lock-down customization permissions, in order to prevent the personalized pages being made too offensively awful by aesthetically challenged members... nobody wants to see some of those really ugly MySpace pages on your vBulletin installation! The 'About Me' tab of each member's profile page has edit controls, allowing them to quickly change values without leaving their profile page. Clicking on an attached image will now open a lightbox rather than open a new window, with the image scaled to fit the browser viewport. A click on the image in the lightbox will open it in a new window as before. 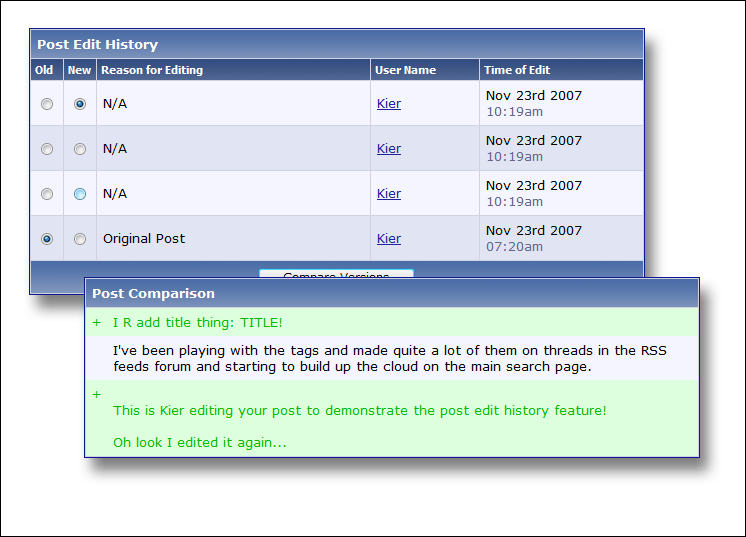 For boards where the history of posts is important, it is now possible to log all edits to posts and then review the changes at a later date. When performing inline moderation actions, board staff will now be required to re-authenticate themselves if they have not done so in their browsing session. 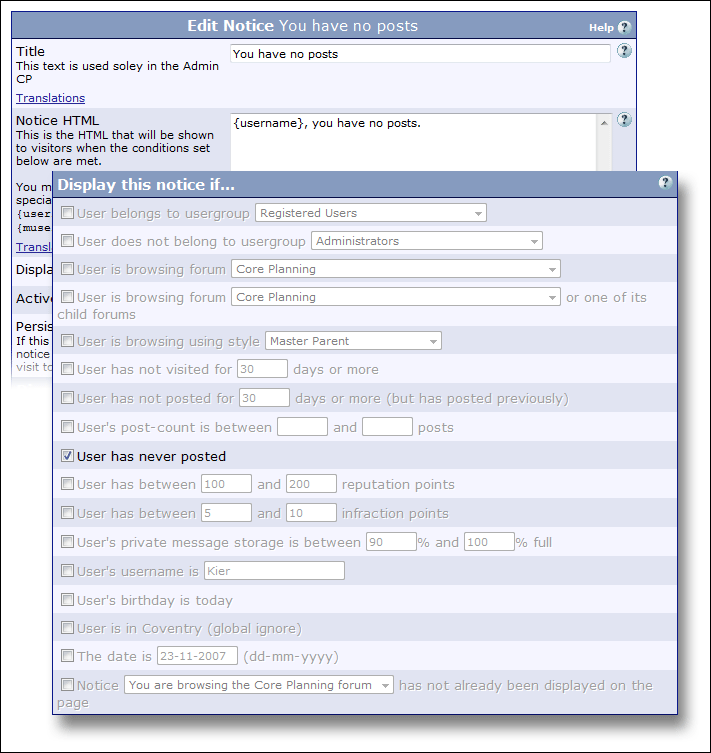 This prevents the possibility of unauthorized parties acting as a moderator on a public computer where a board staff member has accidentally ticked the 'remember me' box. Administrators can now set up custom notifications that will appear underneath the navbar when visiting users fulfil specified criteria. 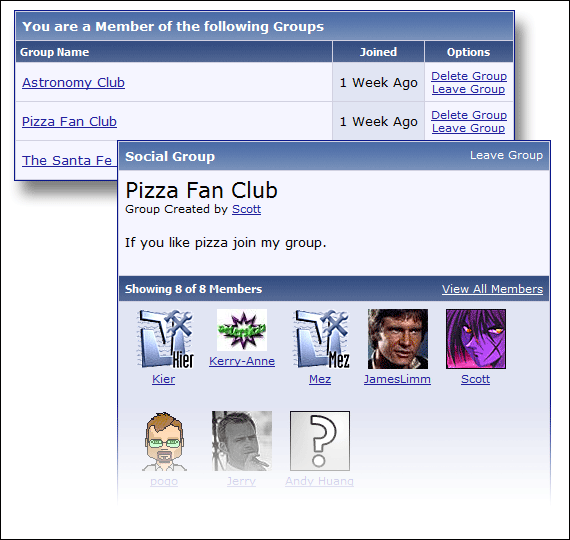 For example, one may want to set up a notice to display when a user is a member of a particular usergroup, or to show a congratulatory message when a user has posted their 1,000th post etc. All times are GMT-8. This page was generated at 5:08pm.